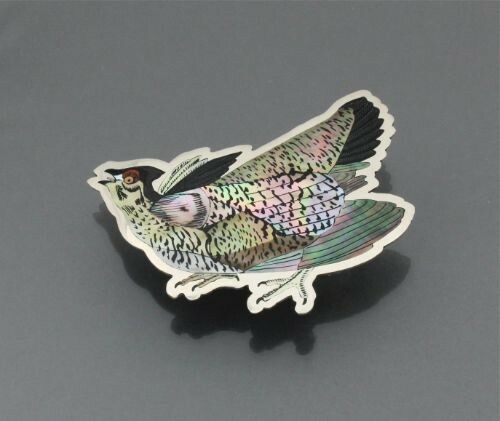 For his limited edition Audubon bird pin set, Dale Edaakie has recreated John James Audubon's North American bird watercolors in realistic detail using inlay jewelry techniques. This Greater Prairie Chicken is one of the birds in the collection. So far, only 7 of these Dale Edaakie sets exist in the entire world - all sold by Marti Struever. If you've fallen in love with an individual bird and do not want to purchase the whole set, we're offering the opportunity to purchase individual birds in the collection. This Greater Prairie-Chicken is entirely hand-inlaid by Dale Edaakie of shell on silver. It is number 6 of 7 so far. The prairie-chicken measures 4" length x 2 1/2" high. It is signed Dale Edaakie on the reverse.